Over 130 installations in 13 different countries worldwide: The business unit Visual Computing (VISCOM) arrived at this conclusion of the past ten years, for its software to auto-calibrate projection systems. In the year 2006, the software for auto calibration of projector systems was deployed for the first time at Zeiss-Planetarium in Jena. Since then it has been used in numerous planetariums, amusement parks, 3D-Surround Cinemas, CAVES, museums, Virtual Reality installations, simulators, control rooms and research centers as well as universities worldwide. All these applications were implemented with multiple synchronized projectors. The specific challenge lies in the coordination of the individual projector images with minimal effort, so that an homogeneous, seamless overall picture emerges on the curved projection screen. As part of the media platform offered, VISCOM has developed a software package that automatically adjusts multiple projectors to any shape and size of screen. The automatic calibration of the VISCOM software distinguishes itself through a high flexibility and speed. Thereby projector clusters that are only roughly adjusted can be aligned with pixel accuracy within minutes. The geometric shape of the projected surface is thereby variable. Since a virtual model of the projection surface is created beforehand. The software recognizes with the help of picture processing algorithms down to the millimeter, how the projector images are to be warped in order to create a seamless total picture. Additionally an automatic brightness correction is carried out. This evens out different brightness levels that exist due to the various pixel sizes and the overlapping areas of the projectors. The resolution amounts to 8K x 8K pixel, this is 8 times the resolution of current 4K-displays. “We will further improve the visual quality and scalability of our projections «, declares Herbert Rüsseler, director of the business unit VISCOM. »Therefore we are adapting and integrating new trendsetting codecs for an ultra-realistic color reproduction. Furthermore we are developing the existing media cluster architectures to a distributed IP-based network that meets tough time requirements. 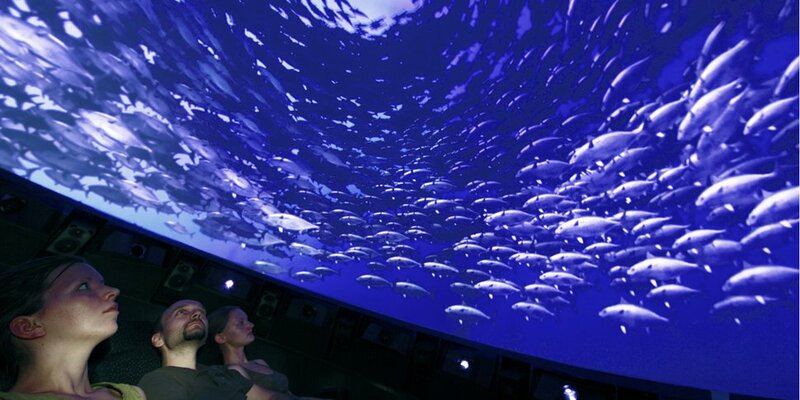 Thereby even large surfaces for example in theme parks can be projected on with high resolutions far beyond 8K."